* This is your pre-requisite for our Teacher Training Level Two (following), and will also allow you to move into Collective Soul Level Three (also to follow), and to continue your empowering dance studies. * For previously certified dancers and teachers, you may review and rejoin any Collective Soul courses in your level for a nominal fee. Highly recommended, it is a great opportunity for you to strengthen your dance and your bond with all of us! The course runs for four weeks, one email a week full of many videos (on Vimeo), MP3s, and written info for you to work on all week — on your own time. There is journaling to do, meditations to listen to and do, assorted exercises and drills, and questions to answer and send back to me. Please be familiar with our Tribal Technique DVDs #3 and #4. Then at the end of each week, we will ask you to do homework and videotape yourself too… to show us what you are working on that week and how you are doing so that we can help you with what you need! You attach your videos in our private FB group, so we can all participate together, since we are in separate locations. You can always post questions to us too. **You must be committed to this time frame and allow yourself time to do the work and stay with the weekly requirements! This is of the utmost importance…we all need to stay on the schedule together for the most benefits to be had from this outstanding opportunity! 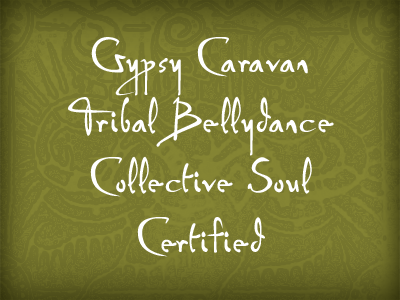 *You will be tested at the end of the session, and when you pass, you will be certified in Gypsy Caravan Tribal Bellydance® Level Two Collective Soul Tribal Bellydance Certification program! If you are not ready to be tested at the end of the four/five weeks, you take the time you need and do it when you are ready and when it fits into my schedule…no worries at all! What I expect of you to pass and be certified, is to meet my criteria–which is understanding the moves in your body and your mind, knowing the names, identifying the drum rhythms, playing your finger cymbals, answering the questions sent to you! If you don’t pass the first time around, no worries…you practice on your own time until you are ready to retest (there is a $100 fee for retesting or late testing). Everyone learns at different speeds and I honor that in each of you! Not a problem, I really want you to understand the moves and the dance, because Tribal Rocks! There will be a small fee for retesting. Make sure you have read Paulette’s book: Tribal Vision: A Celebration of Life Through Tribal Belly Dance. Be familiar with Paulette’s Tribal Technique DVDs #3 and #4, and check through some of the online classes too, available for purchase and to download on her websites shopping page. We will send you a listing of steps to help you prepare for the course, along with the applications after you get your deposit in! Please have the Gypsy Caravan CD, Caravan Rhythms. Dance clothes (no super long or wide legged pants or skirts—I want to see your feet and knees), zils, wear your hair up, your journal and pen, yoga mat if you have one, ipod or computer. A video camera or your phone and a tripod! Paulette Rees-Denis’s Online Class #10–Funky Bits and Groovin’ It Up! 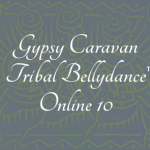 Gypsy Caravan Online Class #6–Circular, slower moves plus 2 Orbits!